Skyscrapers are urban icons. In collective imagination, “skyscraper” means “city” because it is a solution that was invented to meet density issues in big cities. As we were looking for the redefinition of the term “skyscraper” through the use of new programs, we decided to look for somewhere else to implement a skyscraper. Obviously, it has to be the countryside. The main question we had to answer then was: why would we build a skyscraper in the countryside? What issue could justify the need to build skyscrapers in the countryside? As you might know, although water is very present on earth, 97% is salted and 2% is blocked as ice. Actually, there is only about 1% left of liquid freshwater and the UNO and the World Water Council estimate there might be a crisis affecting half the worldwide population by 2030. Freshwater will be a major stake in the 21st century. Indeed the production of a daily food intake for a human being requires 3000 liters of freshwater and the annual rate of freshwater needs is 64 billions cubic meters. Farming makes up 70% of the worldwide freshwater consumption. 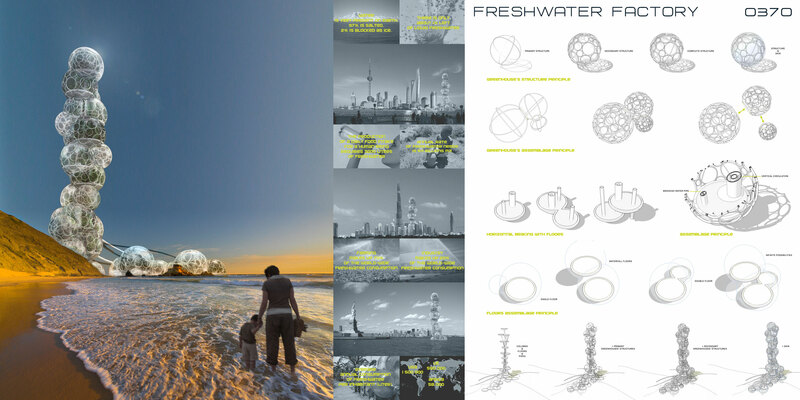 Our proposal is a totally new building: an unseen response to sustainable development and the up coming stakes. The tower is made of several circular tanks filled with brackish water. These tanks are sheltered in spherical greenhouses. The brackish water is brought up in the tower by tidal powered pumps. The water pipes network is incorporated in the tower main structure. The tanks are planted with mangroves: these plants have the particularity to grow on brackish water and to sweat freshwater. So, the mangroves feed on brackish water and then their leaves perspire freshwater. This freshwater sweat evaporates in the greenhouse and condensates by the night into dew on the sphere plastic wall to be collected in a freshwater tank. Then, thanks to its at altitude storage, the produced freshwater can be distributed to the fields by gravitational flow. The total surface of the tower is one hectare. One hectare of cultivated mangroves should produce 30000 liters of freshwater a day. 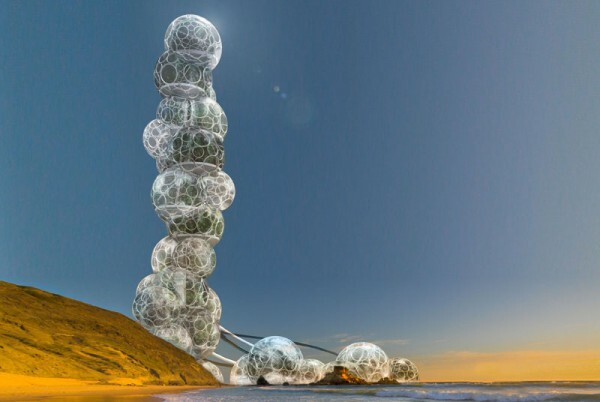 For example, the tower will be able to irrigate a one-hectare field of tomato a day. Almeria is a province located on the south of Spain, along the Mediterranean coast. This is the place where most of European fruits and vegetables are cultivated. Any kind of fruits or vegetables can grow there at any time of the year. Sun does shine more than 2965 hours a year. Greenhouses fill more than 90% of the ground: that is why this area is nicknamed “the plastic sea”. Greenhouses spread over the landscape, undulating over the course of the hills. This is in this sunny and arid climate that our project is to be built. 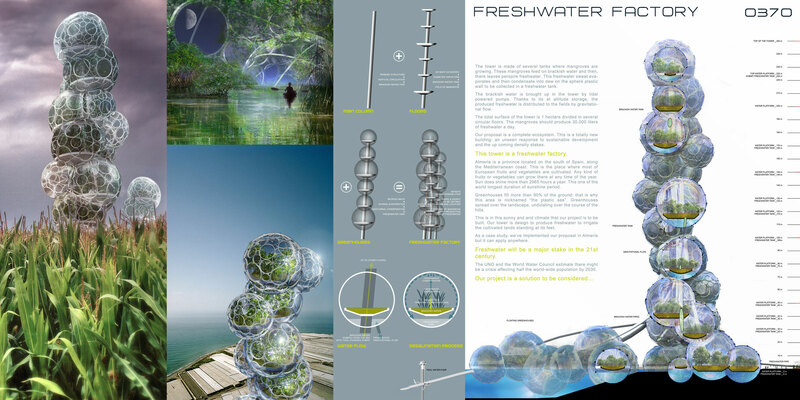 Our tower is design to produce freshwater to irrigate the cultivated lands standing at its feet. We’ve implemented our proposal in Almeria as a case study but it can apply anywhere. This project is a new solution for farming’s needs: this skyscraper is a freshwater factory.